Dobey pipped at the post! 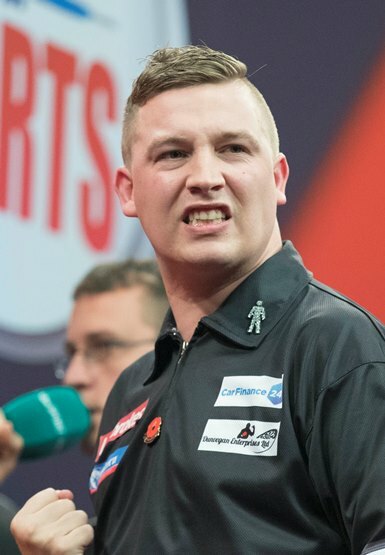 Chris Dobey produced a brilliant display to make only his second senior PDC Final. The Team Unicorn starlet lost in the final of Players Championship 5 in Milton Keynes on Saturday as he was beaten 6-2 by Michael van Gerwen, but it was a lot closer than the scoreline perhaps suggests. Dobey’s return to form continued in style. He has worked very hard at his game and is reaping the rewards. His only other final was way back in October 2016. Van Gerwen beat four Unicorn players on his way to his latest success.....Dobey in the final, James Wade in the semi-finals 6-2, Gary Anderson 6-1 in the quarter-finals and Keegan Brown 6-3 in the last 32. But Dobey enjoyed a terrific day and thoroughly deserved his run to the final. The 27-year-old beat Bradley Brooks (6-0), James Wilson (6-4), Dave Chisnall (6-2) and Stephen Burton (6-4). In the quarter-Finals, the Unicorn man saw off German Gabriel Clemens 6-2 before a stunning 112 check-out saw Dobey win a last leg decider against Ryan Searle in the semi-finals. The final was a story of missed opportunities. Dobey missed three darts to win both the first and third legs and found himself 0-4 down. But he showed great character to win the next two, including a 10 darter. He should have made it 4-3 as well. Dobey had left ‘tops’ only for Van Gerwen to crash in a 160 finish! Dobey averaged over 109 in the final. It was a great display and surely the start of things to come during 2018. Anderson dropped only six legs on his way to the quarter-Finals, while Wade was strong all day.